The Bridge of Hope Nursery & Primary School forms part of the Bridge of Hope Children’s Village and is a few minutes’ walk from our two “Family style homes”. The school caters for the children in the local community and the poorest children are encouraged to apply as Bursaries are available to ensure these children have the opportunity to attend the school. No child is ever turned away due to lack of school fees. The national school dropout rate in Uganda is staggering as many children cannot afford to continue their education. Given the strong association between educational attainment and income earning potential, children who are unable to attend school are likely to remain economically disadvantaged. The Bridge of Hope School operates from our foundation of Christian belief and principles and we put Jesus in the centre of all we do. The children have the opportunity to develop their love for Jesus and an understanding of how precious they are to Him. A good education is vital for a bright future in Uganda and therefore we aim to provide a happy secure environment where children learn, share and play together regardless of religious and social back ground. We encourage children to try things for themselves and not be afraid to make mistakes. Our aim is to treat children as individuals and to fully develop each child’s God given potential. The Bridge of Hope School has three nursery and seven primary classes and all the teachers and support staff are local Ugandan people. 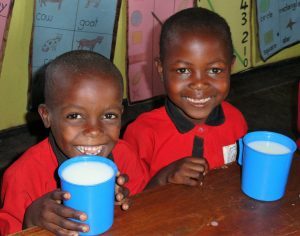 The nursery children attend school for half a day and they receive a cup of porridge during the morning. The primary school children attend for a full day and they all receive a cooked lunch. All meals are provided free of charge and well received as many of the children are hungry and unsure when they will next receive a meal. We teach children English, which is Uganda’s national language, alongside their locally spoken language. There is much research evidence to show that children can easily assimilate two languages at this age and that bi-lingual adults have more opportunities to secure employment. We expect our staff to develop friendly and supportive relationships with the children’s caregivers and local community. A Parent Teachers Association (PTA) works hard to encourage caregivers to understand and be involved in their child’s education and also support the teaching in the school by reinforcing good behaviour and a desire to learn. We are a Christian charity educating some of the poorest children in Uganda to help them break out of the cycle of poverty.